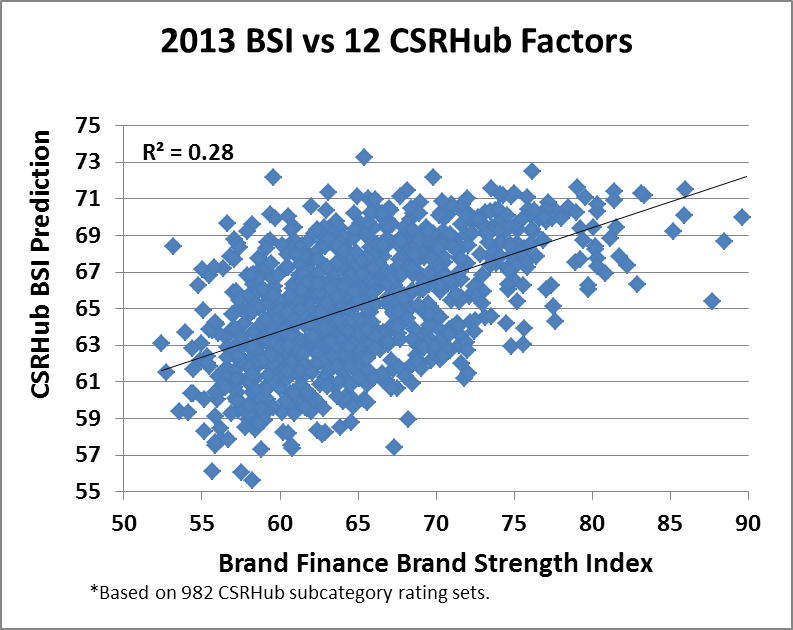 Two years ago, CSRHub and Brand Finance collaborated on a study about the relationship between Brand Finance’s Brand Strength Index (BSI) and CSRHub’s corporate social responsibility (CSR) metrics. We found a correlation of 28% between these factors for a set of more than 1,000 companies from a wide range of industries. Since then, CSRHub and Brand Finance have each continued to build and expand their data sets and to study the relationship between them. Brand Finance has recently published the first section of its 2014-15 data set—information on the brand strength for the world’s top 500 financial companies. CSRHub got early access to this data and compared it against the latest CSRHub data set. 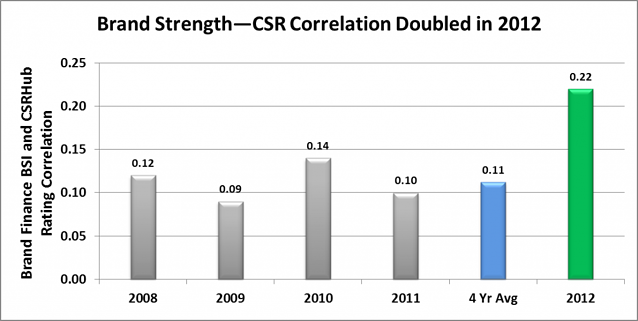 We once again found a strong correlation between brand and sustainability. 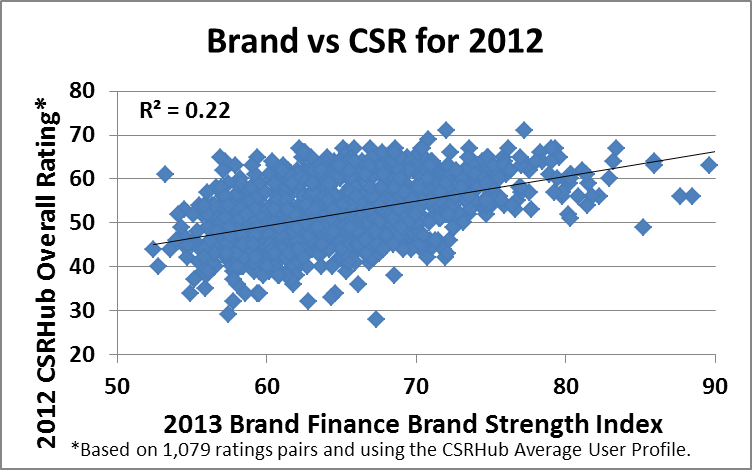 Each year, Brand Finance reviews the brand strength and value of thousands of companies. 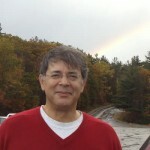 Its rankings shift and change as companies compete to build their brands. The 500 financial companies on this year’s list include 44 new entries. 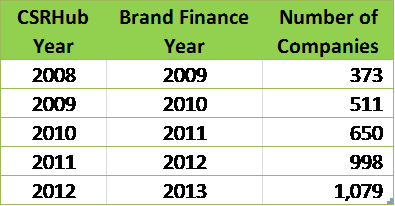 Unlike CSRHub, which focuses only on parent companies, Brand Finance generates separate measures for each brand a corporationowns. As a result, 59 companies have more than one entry on this year’s Brand Finance Banking 500 list. 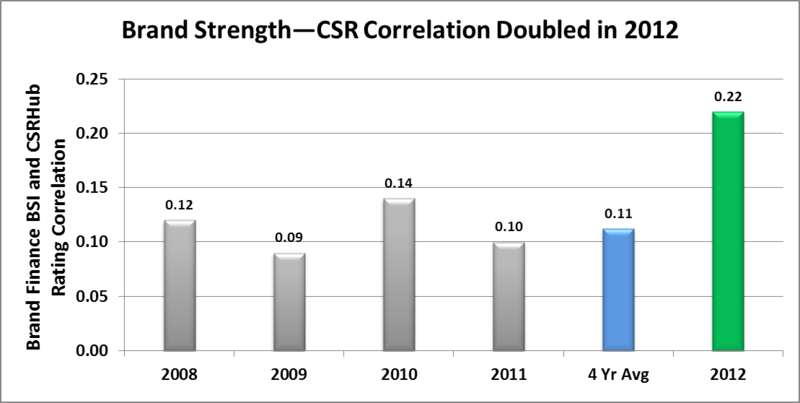 CSRHub tracks the sustainability performance of more than 13,700 companies in 127 countries. After removing duplicates, CSRHub has 95% coverage of Brand Finance’s Banking 500 (419 of 441 non duplicate names). CSRHub tracks twelve different measures of sustainability performance. Our 2013 analysis used only data for companies where CSRHub had all twelve factors available. After applying this restriction, the number of companies available for this year’s analysis shrank to 284. 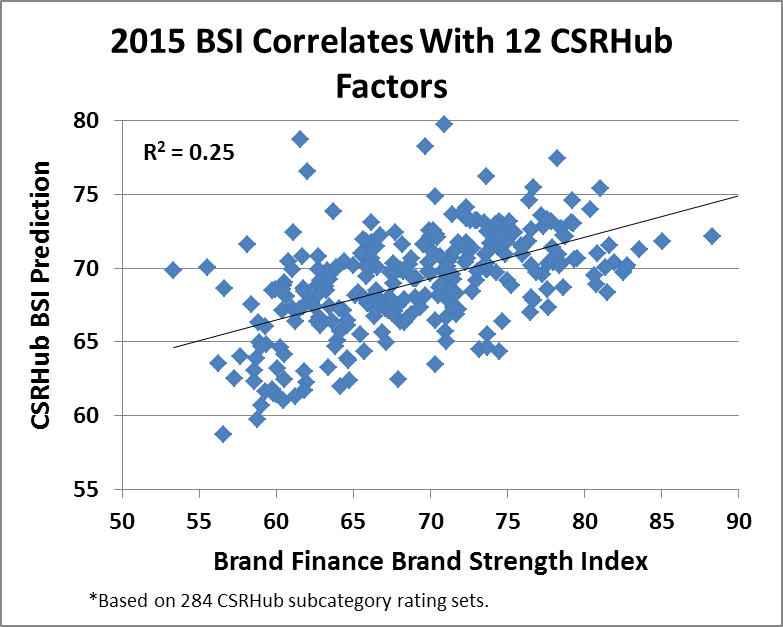 The correlation between Brand Finance’s BSI and CSRHub’s twelve subcategory measures of sustainability was 25%. This is close to the 28% correlation we saw in 2013 across a data set that was almost four times larger. 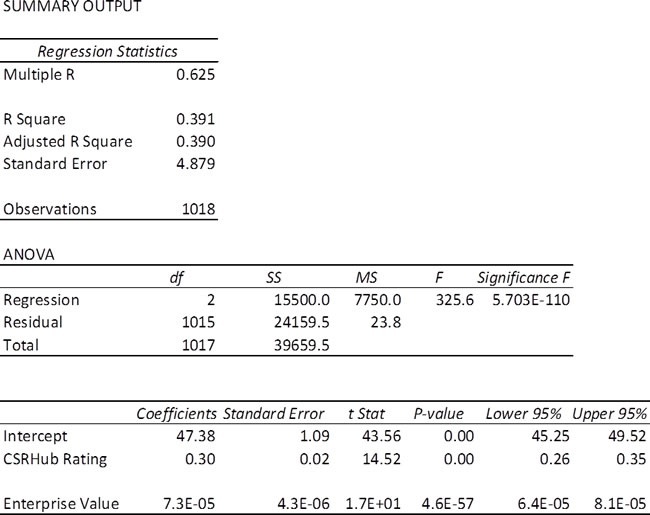 The F factor (a measure of the strength of our correlation) was 8.8—indicating there is only a tiny chance that the correlation result was random. 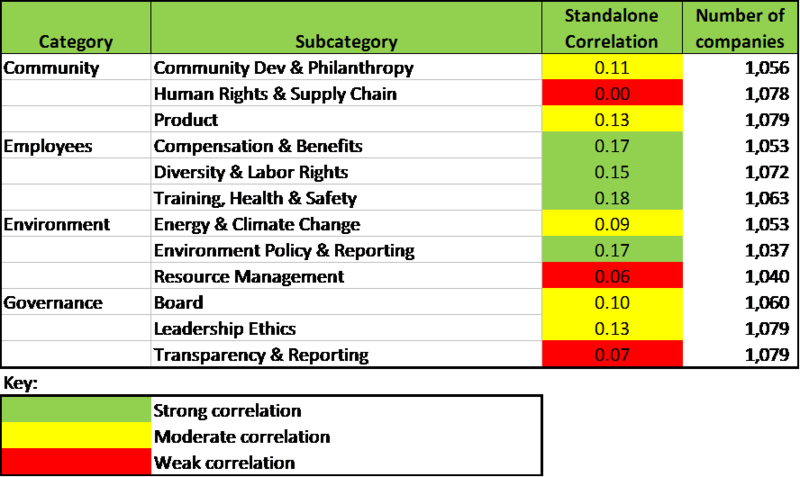 The detailed correlation matrix (below) shows that five of CSRHub’s twelve sustainability factors had a significant relationship with Brand Finance’s BSI. In our previous study, the strongest relationships between sustainability and brand were for Compensation and Benefits, Diversity and Labor Rights, Training Health and Safety, and Environment Policy and Reporting. 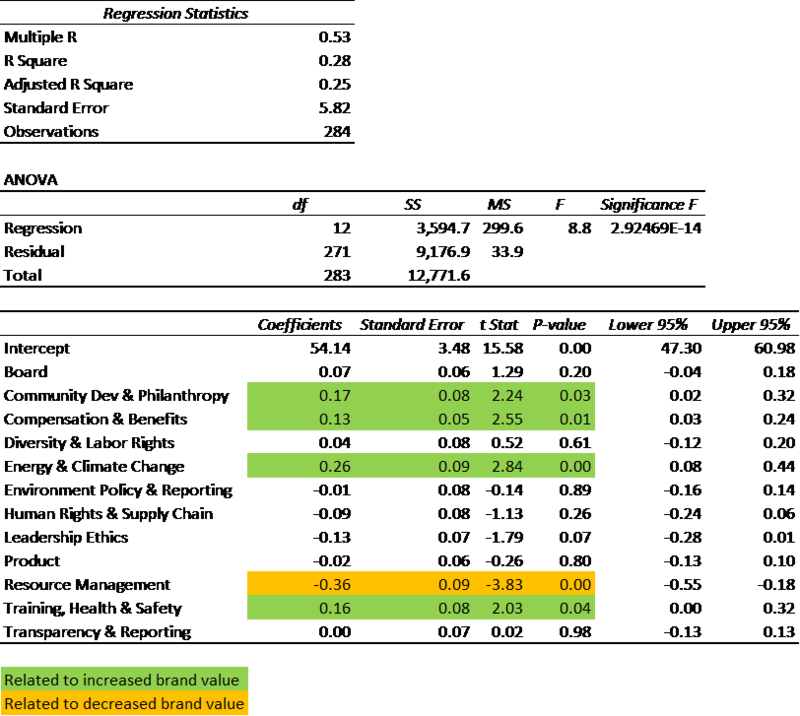 All of these relationships were positive—better performance on these indicators seemed related to higher brand values. In our current study, Community Development and Philanthropy still shows with a positive coefficient, but Diversity and Labor Rights and Environment Policy and Reporting do not have a similar concurrence. Training, Health & Safety performance continues to have a strong positive relationship with brand. Resource Management—a factor that previously had a low correlation—shows up with a strong negative relationship. This kind of “rotation”—where the strength of relationship between our factors and an output variable change over time—is something we’ve seen in other studies. We believe it is due to changes in emphasis among stakeholders who are interested in sustainability. These differences may also be related to industry variations. Our previous study covered a much broader range of industries than this one. 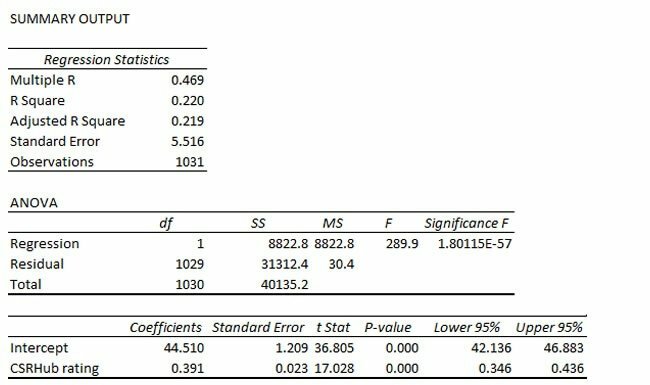 Finally, the smaller sample size of this study may make it difficult to fully integrate all parts of sustainability into our analysis. We believe we have shown that the relationship we demonstrated two years ago between sustainability metrics and brand strength continues to persist. While we cannot claim that there is a causal connection—that sustainability performance directly enhances brand strength the persistence of this relationship over time strengthens our belief that investments in sustainability could help drive positive changes in brand value. The release of Brand Finance’s Banking 500 results will be followed by further data from Brand Finance on thousands of other top brands. As we receive these results, we intend to integrate them with what we have discerned about the Banking 500. We hope to continue improving our understanding of how brand managers and sustainability managers can collaborate to achieve mutually beneficial goals.